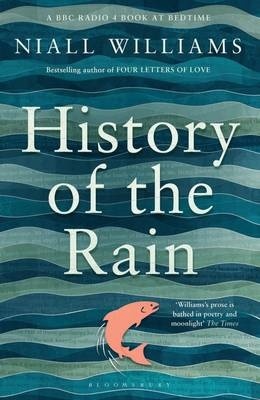 History of the Rain was long-listed for the 2014 Booker, but it’s drawn the occasional caustic response from doubters at Good Reads. I quite enjoyed it, but I think its appeal will depend on whether or not you have a soft spot for the Irish. If you ‘hear’ it in a soft Irish lilt; if you can picture a small farm with a quaint cottage; if you ‘know’ the intimacy of an Irish village; and above all if you are familiar with the style and steely sentimentality of Irish storytelling – then this book will be a pleasure. But if not, it may not be for you. Even if you’re the sort of reader, as I am, who enjoys allusions to the books of a lifetime’s reading. You don’t need to be a feminist to notice that this is a male author writing in a female voice, but maybe you do to notice that for Plain Ruth Swain this story of her family is an homage to the males. Well, they are dead, tragically so, of course, and perhaps it’s more compelling to construct a story around the romance of tragic death. It is not so interesting to take much notice of Ruth’s stoic mother who plods through the book making bread and providing raincoats when they are needed. Having fallen in love with a romantic who turns out to be a poet incapable of earning a living, she clearly has no time to read a book at all. Ruth, like her mother, has a tolerance for male frailty that will either charm you or irritate you. In Virgil (the father, the poet) the incompetence is because he is a poet. This can involve long hours standing by the river with rain streaming down his back or it may involve long hours humming in the attic, oblivious to his family including, of course, his wife. She doesn’t seem to mind, she is a saint. She understands that poets need this sort of self-absorption in order to do their thing. And the village is very proud of his (unseen, unpublished) poems too, so they are tolerant as well. I hasten to add that I understand this self-absorption myself. Ours is a creative household, and both of us know that an interruption at the wrong moment can thrust the elusive word or perfect cadence into eternal oblivion. But few relationships survive one-sidedness – and decades of grinding poverty in the service of art usually depend on manifestations of love of some sort. Apart from Virgil’s early and risible attempts at farming (which take place before he realises he is a poet) there’s not much evidence that he loves his wife. Perhaps she intuits it. Novels, of course, don’t have to be realistic, and the narrator is an adolescent confined to a sick bed so a testy reader has to keep reminding herself that the artifice here in this book necessarily limits her perspective. I found the first part of the book interesting, lost interest in the middle and found myself bemused by the Booker fuss, but ended up completely absorbed by the last third of it, possibly because this is where the tragic deaths are revealed and Ruth’s own demise seems imminent. If you like weeping over your novels and you like caring about the characters, you’ll probably love this. Kim at Reading Matters certainly did, see her review here – and obviously the Booker judges did too. ‘And why were you there? What were you sailing there for?’ Aeney wants to understand how you can get into a map that’s on page 28 of an Atlas. ‘Why was I there?’ Dad says. My father’s eyes are looking straight up at the slope of the ceiling and the cutaway angle where the skylight is a box of navy blue with no stars. The question is too big for him. I will see this often in the years to come, the way he could suddenly pause on a phrase or even just a word, as if in it were a doorway and his mind would enter and leave us momentarily. Back then we thought it was what all fathers did. We thought that fatherhood was this immense weight like a great overcoat and there were all manner of things your father had to be thinking of all the time just to keep the overcoat from crushing him. ‘Well,’ he says at last, ‘that’s a long story. (Astute readers will recognise that Virgil is telling his kids about R.L. Stevenson’s Treasure Island, and that he hasn’t been anywhere a Caribbean blue either). History of the Rain is full of treasures like this. It’s just … it’s just that it’s not enough, not for me. Thanks for the link, Lisa.